Our SUNSET CHALET is a Sunbathed, Stylish and well equipped home. Perfect for Honeymooners!! Panoramic Lake Tahoe views throughout! 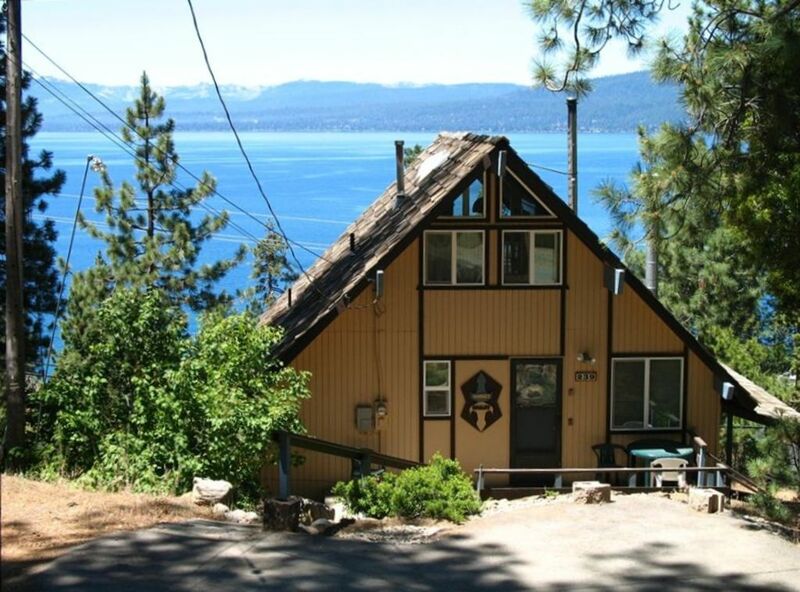 You will be treated to incredible views of Lake Tahoe throughout the home!! Our home is lavishly equipped overall with washer and dryer, bathroom with tub/shower combination. 2 Queen size beds (white goose down comforter) and full size sofa bed. There is a second TV in the upper bdrm . DSL added and wifi is available. The kitchen is a full kitchen with all appliances ,dishwasher and plenty of counter space for mixing and fixing. There is a small desk with answering machine for messages. There is both gas heat and a glass front wood burning stove for cozy or romantic evenings. The living room has a large Lshaped sofa that also converts to a full sized sofa bed if needed. The deck facing and overlooking the Lake has deck chairs, gas BBQ, and table. The upper bedroom also offers panoramic views of sunset or sunrise over Lake Tahoe. There is a second TV in the upper bdrm . The unit has a washer /dryer . The special appeal of the Sunset Chalet is the stunning Lake Views throughout the home. They literally invite you to just sit back, relax and gaze out the windows. The deck facing and overlooking the Lake has gas BBQ, chairs, , table and weather permitting will be enjoyed as you soak up the sun and fresh air while the stunning views of Lake Tahoe arrest you. The views inside and out are just magnificent. The Sunset Chalet is customized for comfort and offers many extras. White goose down comforters for a very cozy nights sleep. Automatic entry lights help with late arrivals. The Sunset Chalet in North Lake Tahoe is located 1/2 mile to Nevada state line restaurants and casinos and 6 miles to Nortstar Ski area. We permit a small well behaved, house broken member of your family with a $15/day surcharge. However, it is important to please inform us if you want to bring along your pet. They must be under flea and tick control and not be left alone in the home for extended periods of time..
We accept visa, master card, paypal , personal checks. Please note that the lower level (unseen and below street level) has a studio apt with full time tenant. He has private and separte entrance, private stairway and parking so will not interfere with your use or enjoyment of our home. New Year's with Boya and Carol . We knew Lake Tahoe to be one of the most beautiful places on earth and a year round vacation destination. So, we actually bought our vacation home before our home home. North Lake Tahoe is a little less crowded and busy than the south shore but has everything you would want for recreation. Near all of the ski resorts and especailly Northstar. We are constantly mesmerized by the view. It always is changing and it invites you to just stop and gaze out the windows and enjoy and praise the creator for such beauty. As our home away from home I can conduct my business at the desk with the high speed internet and that is important to me as my business travels with me. Great times with friends playing games or watching movies that we don't take the time to do at home. portable airconditioner upstairs that will circulate the air when hot weather arrives. Both gas heat and wood burning stove. we suggest Presto logs for the fireplace. Stackable full size washer dryer in unit. directly in front of home. Glass front wood buring stove. Request that guests use presto logs . always suggest you bring any favorite seasonings, etc.